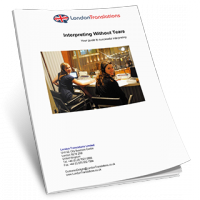 As you know we were let down at the last minute by our original interpreter and you were able step in and help us out with the minimum of fuss. I was hugely impressed with Christina’s interpreting skills and she was a huge help to us in determining the prospects of success of our clients claim. Christina was able to relay our client’s evidence to us in an accurate and helpful fashion and as a result we were able to take clear instructions from our client and accordingly provide our client with clear advice. As our client’s claim continues we will require ongoing translation and it follows that I will have no hesitation is using Christina again. Once again thank you for your excellent service.